Mix all the spices in a pint jar to use as needed. Any extra can be stored in a cool dry place. Makes enough for approximately 9 lbs. of sausage. Use 2 Tbsp. for every 1 lb. 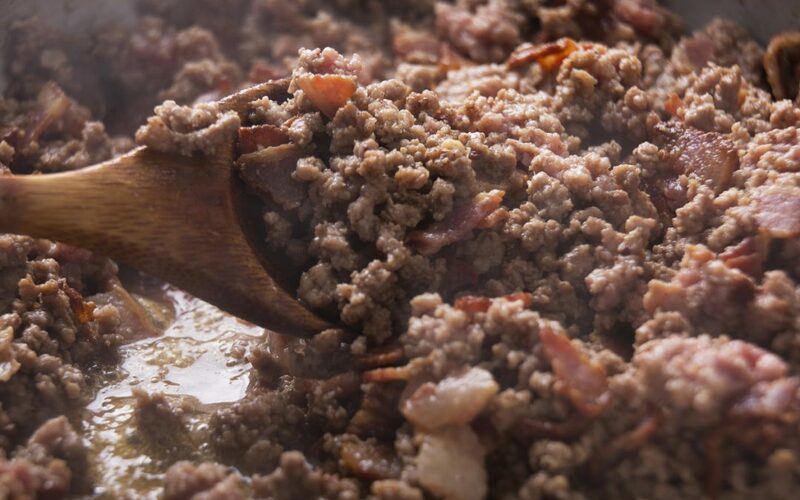 of ground beef; mix with raw ground beef and cook in a skillet. A delicious alternative to pork sausage, and can be made ahead of time and frozen. Add all of the ingredients into a large (and we mean large) mixing bowl, and lightly toss until the dressing is evenly dispersed. Serve immediately. Place crust on an ungreased baking sheet. Top with sausage and cheese, and bake at 450° for 10-12 minutes or until cheese is melted. In a medium mixing bowl, combine the tomatoes, sliced basil, oil, garlic, thyme, vinegar, and salt. Spoon evenly over pizza. Garnish with additional basil if desired. Combine first 8 ingredients and shape into a flattened round loaf in an 8x8x2″ baking dish. Mix the sauce ingredients together. Use a spoon to make a depression in the top of the loaf; pour sauce in the depression, and bake at 350° for 55-60 minutes. In a small bowl, mix coconut sugar, soy sauce, sesame oil, red pepper flakes and ginger. Sauté the garlic in the coconut oil for about 1 minute. Add ground beef and cook until browned. Stir in soy sauce mixture and sliced green onions, and allow to simmer until thoroughly heated. Serve over rice, and garnish with extra green onions. The team here at Rafter W Ranch loves to put quality meat on your table, and we also like to give our customers some great ideas how to use it; are you ready to try out our grass-fed ground beef in some new delicious recipes? We guarantee they will fill your kitchen with aromas that will bring the whole family rushing to the kitchen table in anticipation! Shop our online store today, and taste the goodness of grass-fed beef, lamb, and poultry!